A sunset boat cruise, on the Zambezi is a magnificent experience along with the sounds of the wild, which only Africa can provide. 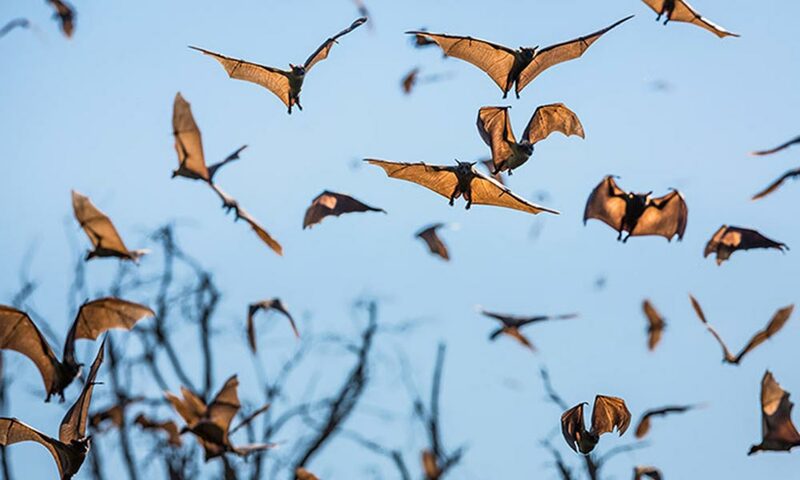 This safari is a combination of the wildebeest migration in Liuwa Plains and the migration of the “Flying Foxes” or straw coloured fruit bats in Kasanka National Park. Enjoy Tiger fishing at Kabula and a ride in an authentic Mokoro in search of a Pel’s Fishing Owls nesting site, and perhaps an island walk or a cultural visit. This self-drive safari is not to be missed and is one of Africa’s greatest wildlife spectacles, if not the world. Meet and greet at the campsite at Chobe Safari Lodge in Kasane. Spend the evening around the campfire where the briefing about the forthcoming safari adventure will take place. 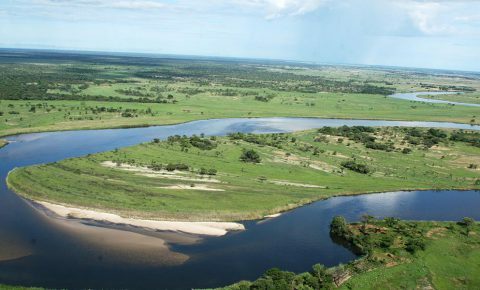 Drive via Katima Mulilo in the Caprivi Strip of Namibia to Kabula Tiger Lodge, situated on the western bank of the Zambezi River in Barotseland. Stay for the next two nights in the campsite overlooking the Zambezi River. Tiger fishing is the main activity at Kabula. The days’ other adventures could include a ride in an authentic Mokoro (dug out canoe) in search of a Pel’s Fishing Owls nesting site, and later perhaps an island walk or a cultural visit to a nearby traditional Lozi Village. A sunset boat cruise on the Zambezi is also a magnificent experience along with the sounds of the wild, which only Africa can provide. Visit www.kabulalodge.com for more information on Kabula Lodge. Drive via Kalabo , cross the Lualinga River by hand driven pontoon, and head into Liuwa Plains, one of Africa’s last hidden secrets and spend the next three nights in our bush camp, pitched in one of the beautiful tree islands. This is serious un-commercialized Africa and a once in a lifetime experience for most people. 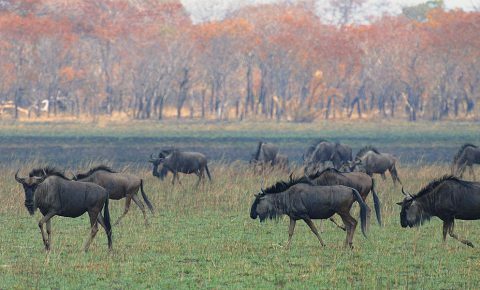 Explore Liuwa Plains in search of Lady Liuwa, the last lioness and be part of the thousands of wildebeest that came down for the calving season on the Plains. After taking down camp, enjoy a drive back to the pontoon at Kalabo and drive via Mongo to Mayukuyuku campsite on the banks of the Kafue River. This is an overnight stop, depart early morning for another beautiful drive to Forest Inn campsite at Mkushi. Get ready to depart for Kasanka National Park. It’s quite a long drive of 600 km but the roads are in good condition. 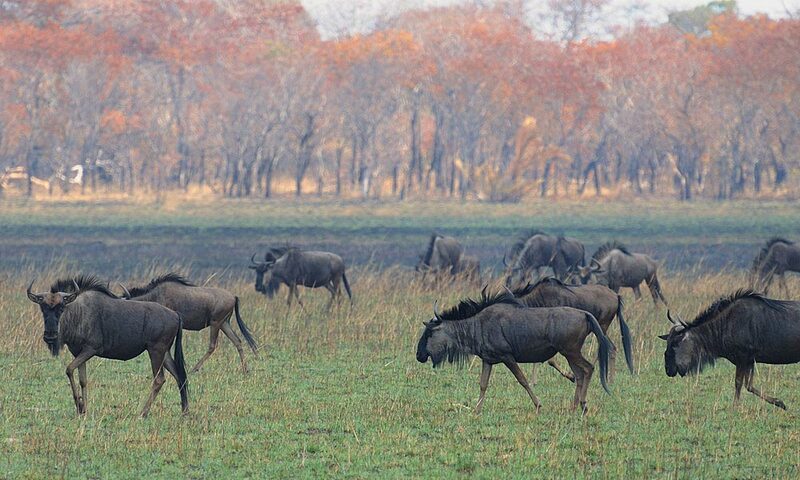 Kasanka is situated on the western edge of Lake Bangweulu and is one of Zambia’s smallest parks covering just 420 square kilometers and the only park in Zambia under private management. 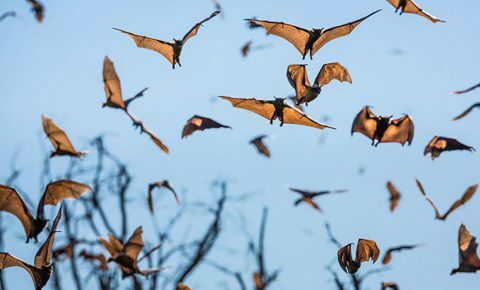 During November each year five million straw-coloured fruit bats take up residence on one hectare of Kasanka National Park’s Mushitu swamp forest. This is a sighting not to be missed and one of Africa’s greatest wildlife spectacles, if not the worlds’. Camp at Pontoon campsite, which is the largest and closest to the bat forest. Enjoy a drive from Kasanka back into a southerly direction to Lusaka and stay over in the campsite at Eureka Farm. Alternatively you may opt for a chalet at your own cost. Drive to Livingstone where we will set up camp at Bushfront Campsite. This is where the safari ends and seeing that it is our last night together, we can opt to have a farewell dinner at one of the restaurant in town. The following day I will leave for home, those who wants to join in are welcome to do so. You can also use the day to visit Victoria Falls or do a microlight flight over the falls, something that is highly recommended. Send us an enquiry and a travel expert will contact you to help you plan your holiday. You're under no obligation to buy anything. What’s in store for the Land Rover Defender? © Copyright 2019	All Rights Reserved. LeisureWheels.co.za is designed, developed and maintained by RamsayMedia.